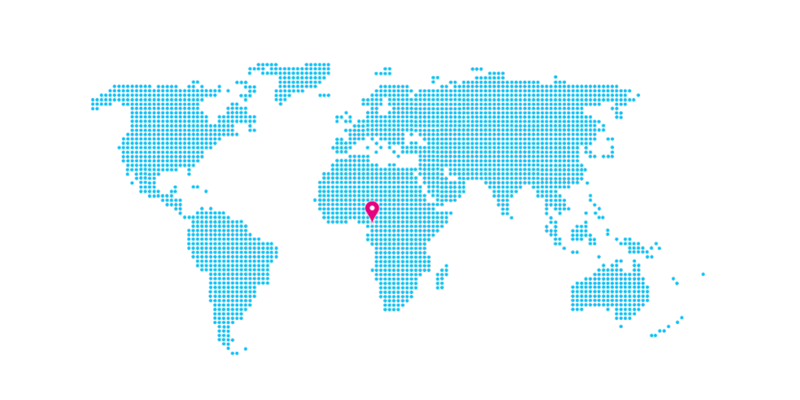 IS SITUATED ABOUT 40 KM FROM KRIBI IN THE SOUTH REGION OF CAMEROON, IN THE OCÈAN DIVISION. Mvoumagomi's Pygmy community lives deep in the tropical rainforest. Roads are nonexistent making access and communication very difficult, even with the relatively nearby town of Kribi. During the rainy season the village is cut off with increased dangers from flooding. The village is located about 40 km from Kribi by canoe on the river Lobe. Accessing the village requires an additional half hour walk through thick bush. Mvoumagomi's villagers live in communities of 30 people on average, 100 people at most. The Pygmy people of Central Africa are the principal hunter-gatherers of the tropical rainforest. Groups establish temporary camps of huts constructed from bent and woven branches covered in large leaves. They hunt and gather all their own food. The men hunt and trap in the surrounding forest, using poisoned arrows and spears to great effect, welcoming the help of dogs on these excursions. Fishing is very important in Pygmy culture and young boys are taught to use fishing rods at a young age. The men fish using a chemical obtained from crushed plant material. Using fast-moving river water, they disperse the poison downstream. This non-toxic substance deprives fish of oxygen, making them float to the surface to be easily collected. Another method of fishing, performed generally only by women, is dam fishing, in which water is removed from a dammed area and fish are simply picked up from the exposed riverbed. Children and adolescent girls often accompany the women when they go fish-bailing in nearby streams. More than only fishing with adults, their job is also to help the women by watching over the infants while they fish. Women cultivate plants, such as plantains, cassavas, and bananas and practice beekeeping. The group remains in one area until it is hunted out. It then abandons the camp and settles down in a different part of the forest. The group is communal and makes decisions by consensus. During the dry season, it is common for the Pygmies to move and set camp within the forest often in order to keep the group fed. Men hunt from dawn until dusk and the women gather two types of fruits: "mabe" and "peke," which are used for both juice and nuts. Throughout the year, Pygmy people monitor bee activity in order to obtain honey or "poki." A simple communal shelter serves as a main camp for the villagers. During the rainy season, they collect water in basins and buckets to keep the bare dirt floor dry. A small fire is used for cooking. When on hunting expeditions, they construct more temporary shelters by weaving saplings together and covering them with overlapping rows of broad leaves. The Pygmy peoples of South Cameroon are traditional semi-nomadic hunter-gatherers. These communities identify themselves as ‘forest peoples’ due to the fundamental importance of the rainforest to their culture, livelihood, and history. They live in intimate connection to and knowledge of the forest. Unfortunately they have been squeezed between conservation areas and land which has been handed over to multinational companies for exploitation. Oil palm and rubber tree plantations become no-go areas for them without compensation for the loss of their land or regard for the damaging impact on their livelihood or wellbeing. 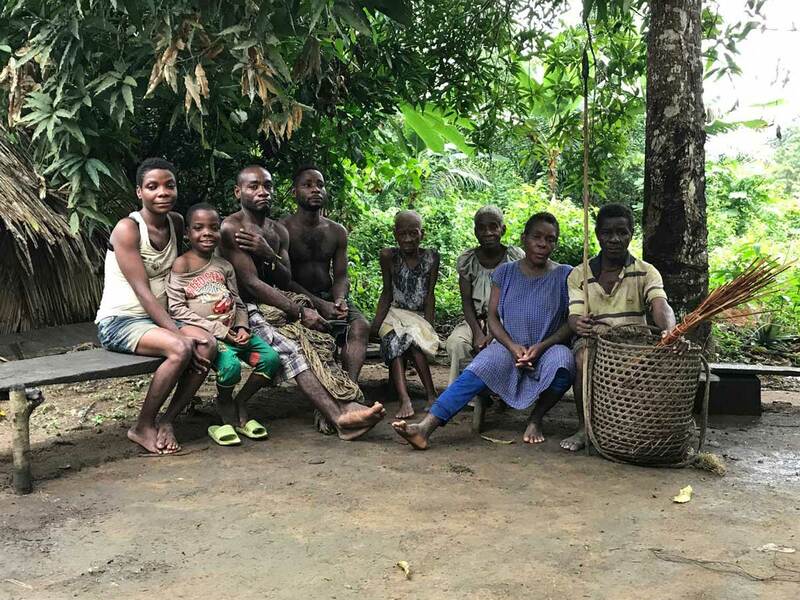 Their health is deteriorating as mosquitoes are rife among the plantations, increasing malaria in the area, while general nutrition of the Pygmies has suffered radically due to compromised access to their traditional forest foods. For drinking water, villagers must make a half hour trek to the river Lobe. This task falls primarily to women, but children can also responsible for this chore. They walk barefoot through dense forest to reach the river, and then must be very careful not to slip from the muddy banks into the crocodile infested water. Children are most vulnerable to being lost to these risks. The most difficult thing of all can be getting the gathered water back home without being attacked by wild animals. Water quality can be unpredictable and storage in open pots or buckets in the camp also poses problems. The community constantly faces the dangers of consuming contaminated water. This makes providing a sustainable solution for easily accessible drinking water an imperative for Mvoumagomi, ensuring a safer, healthier life for all the villagers. ln the Mvoumagomi village, toilets do not exist at all. As with all other necessities, the community uses the forest "when nature calls." This practice poses health risks. The presence and possession of toilets in this community is urgently needed to provide sustainable sanitation, giving villagers a sense of dignity, security, and equality with others. A toilet is not a luxury, but an essential necessity for good hygiene and disease prevention for the entire community. 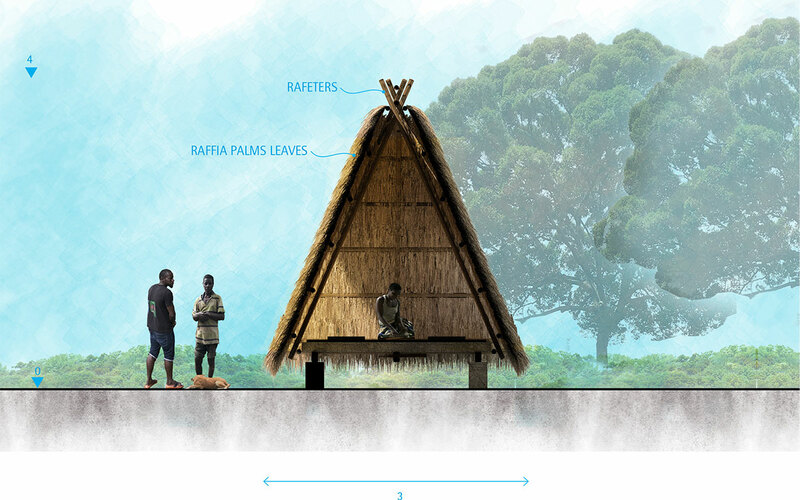 The Warka Toilet is designed to use simple, sustainable materials indigenous to the region - earth, palm leaves and wood - and constructed adopting local techniques. Two separate sides provide facilities for men and women. With this dry system, waste is turned into useful compost. Each toilet has two holes: one for urine and one for excrement. Liquid waste and solid waste can therefore be separated, which is very important. Instead of flushing the toilet, soil is added to the hole so that the excrement dries out quicker. Once the solid waste is dry, a process that takes around one month, the resulting manure can be spread on the ground. Urine, just like excrement, is a natural fertilizer, it ends up in a reservoir where it decants. The process separates out any impurities from the rich urine, which can then go straight into a network of pipes that are directly connected to a irrigation system. Dry toilet reservoirs are completely watertight so there‘s no risk of soil contamination. Likewise with the manure, there‘s no risk of contamination because human waste can no longer harbour diseases once it‘s completely dried out. 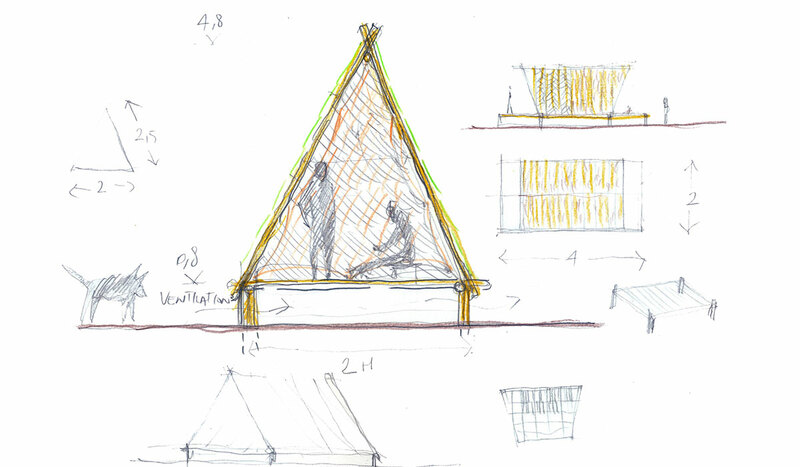 Warka House will provide substantially better shelter with an insulated floor and proper roof to prevent rainwater dripping inside. With our support, the structure will be constructed using ancient local traditions of working with bamboo and other natural materials by the villagers themselves. The upgraded house will offer higher standards of hygiene and comfort for the villagers of this isolated community.